MICROCHIP Technology has introduced a low dropout regulator with ceramic capacitors that operates at a very low supply current. It is attachable to practically any microcontroller and is a low cost, low power regulator ideal for virtually any portable or battery-powered application. 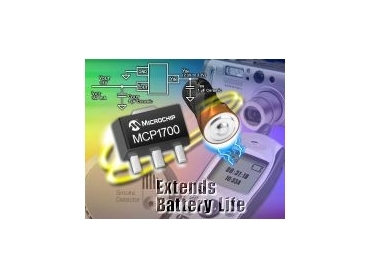 The MCP1700 can deliver up to 250mA of current while consuming only 1.6μA of quiescent current (typical). The device maximises battery life with a dropout voltage of 178mV at 250mA. It increases performance with an output voltage accuracy of ±0.4% and exceeds in dynamic behavior with a better line regulation of ±.75%V and load regulation of ±1.0%V. The MCP1700 enables the use of low-cost ceramic capacitors on the input and output, reducing system cost. The regulator is stable with 1μF output capacitor. Its overcurrent limit and overtemperature shutdown provide a robust solution for any application. The device is available in three-pin, SOT 23, SOT 89 and TO 92 packages.